Your mother belittles your clothes, your job, and your boyfriend. But instead of fighting back, you wonder if your mother is right and figure that a mature person should be able to take a little criticism. If you think things like this can’t happen to you, think again. Gaslighting is an insidious form of emotional abuse and manipulation that is difficult to recognize and even harder to break free from. 1) Does your opinion of yourself change according to approval or disapproval from your spouse? 2) When your boss praises you, do you feel as if you could conquer the world? 3) Do you dread having small things go wrong at home—buying the wrong brand of toothpaste, not having dinner ready on time, a mistaken appointment written on the calendar? 4) Do you have trouble making simple decisions and constantly second guess yourself? 5) Do you frequently make excuses for your partner's behavior to your family and friends? 6) Do you feel hopeless and joyless? 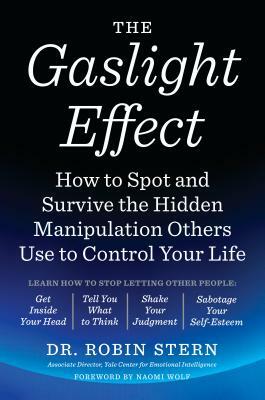 In this groundbreaking guide, the prominent therapist Dr. Robin Stern shows how the Gaslight Effect works, how you can decide which relationships can be saved and which you have to walk away from--and how to gasproof your life so you'll never again choose a gaslighting relationship. ROBIN STERN, Ph.D., is the associate director for the Yale Center for Emotional Intelligence and an associate research scientist at the Child Study Center at Yale. She is a licensed psychoanalyst with 30 years of experience treating individuals, couples, and families. Robin is the co-developer of RULER, the Yale Center’s approach to bringing emotion intelligence to school communities and to the workplace; she is a co-developer of RULER for Families and a lead trainer for the Center’s Institutes. Robin is also on the faculty of Teachers College, Columbia University and the author of two books: The Gaslight Effect and Project Rebirth. Robin was a founding member of the Woodhull Institute, where she spent 15 years creating and facilitating development programs for women leaders. She has been a guest on many local and national radio shows and has traveled widely to lecture on emotional intelligence and on relational bullying. Robin regularly consults to schools and companies around the world, and for the last 5 years has worked with Facebook to develop tools that help adults and children develop emotional intelligence and resolve online conflict. Currently, Robin consults to Smilow Cancer Hospital in New Haven, helping physicians and nurses build emotional intelligence. In 2014-15 Robin was a fellow in the Yale Public Voices Fellowship, and her work has been published in popular media, such as Psychology Today, The Huffington Post, Time.com, The Washington Post, The Hill, and Harvard Business Review. She serves on the Emotional Intelligence Consortium and the advisory board for Crisis Text Line and I’ll Go First. Robin lives in New York and treasures her relationship with her son, Scott and daughter, Melissa who are following their own passions.